We facilitate here information on several accommodation options available in the closest vicinity of the venue, including on-campus accommodation. 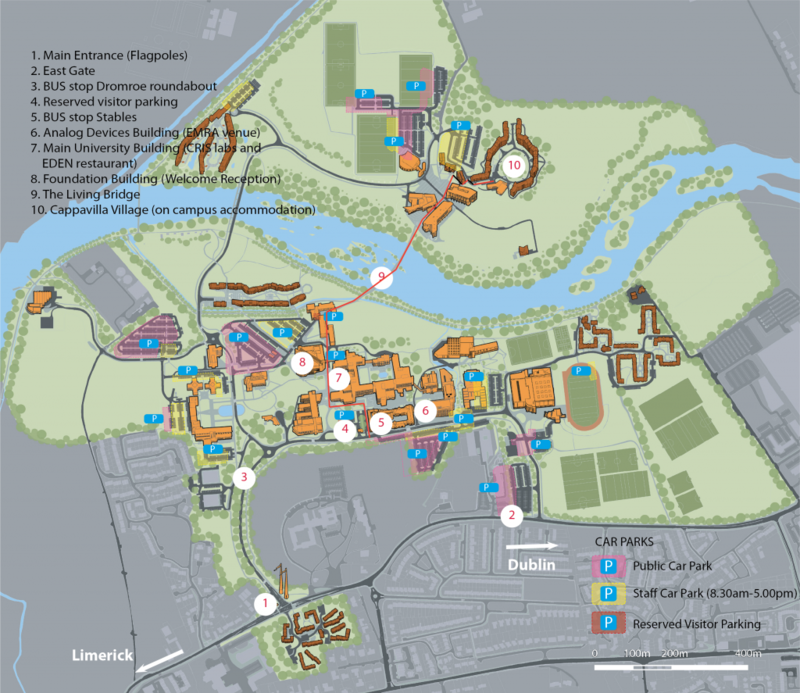 (See Map No.38 for On-Campus Accommodation and Map No. 41 for the venue (Analog Device Building)). NOTE. We advise you to book your accommodation as soon as possible since that the second week of June is the traditional Kennedy soccer cap competition and campus accommodation/nearby hotels will be in high demand. If you are staying in the Cappavilla Village, the shortest pedestrian route from the venue is marked in red on the map below. Alternatevely, you can take the 307 bus at the Dromroe Roundabout stop (not Stables) - see No. 3 on the map. The attendees are encouraged to book on-campus accommodation. The on-campus accommodation is available in Cappavilla Village. It is an attractive apartment-style residence located on the North Campus. €49.00 b&b, per person, per night, single room (en-suite). €70.00 b&b, per night, for a double room (en-suite). NO twin rooms available. The accommodation is in share base apartments (2, 4 and 6 bedroom apartments). All bedrooms have en-suite facilities (i.e. each bedroom has its private shower and toilet facilities). A shared, fully fitted kitchen, and a comfortable lounge area, with cable television. Daily Breakfast is provided for guests, included in our rate. Apartments are provided for people with special accessibility requests. Electric Heating in each bedroom/apartment. All rooms have high speed, wireless internet access. Prepaid card telephone in each apartment. Secure key card entry to each apartment and room. Resident village team on site and dedicated accommodation reception for guests to check in. Shared apartment requests for colleagues/friends can be accommodated where possible. Each guest shall be allocated their own en-suite bedroom and share the living room and kitchen with other residents attending the EMRA 2018 Conference. Full payment is taken at the time of booking. In case you would like to share the apartment with other members of your team you can indicate that in the “Booking note” field or send an email to campus accommodation office at conference@ul.ie specifying with who you want to share the apartment. TO BOOK double room you need to directly contact the campus accommodation office at conference@ul.ie requesting a double room. 1 km distance from the centre of the campus. This hotel is located outside the main entrance to the University of Limerick. 1.6 km distance from the centre of the campus. If you prefer to stay in Limerick city centre, there are hotels in the city centre for all budgets. Visit this link. Bus Eireann runs service from Limerick's City centre to the University of Limerick, line 304 and 304A bus stop City centre (William Street) – bus stop UL (Stables).